I’ve lived in Canada most of my life so I really don’t expect it to actually be spring even when the calendar says it is. But we’ve had hints here and there; just enough to whet your appetite. The days are longer so we don’t have to walk home in the dark anymore. The bright sunshine makes you think it’s warmer than it is. I even saw some buds on the trees the other day. It made me feel like spring. It made me want to make springy things. And what says spring better than flowers? I bought some dried hibiscus last Christmas to make homemade tea as gifts for friends. Unfortunately when you order dried flowers and herbs online the minimum order is… quite large. I ended up with a big bag of various good-smelling things in our storage locker. 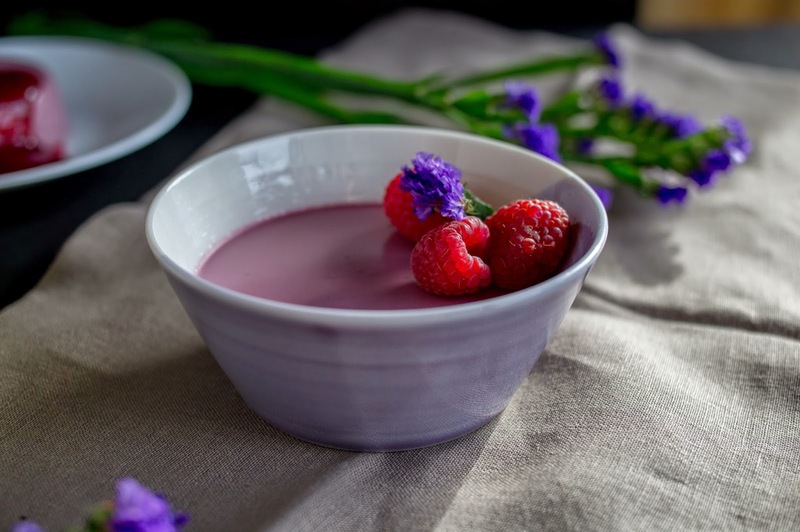 When I was trying to think of light desserts for spring, the hibiscus popped into my head and thus the hibiscus panna cotta was born. Dried hibiscus is a purple-red tangle that smells beautifully fruity. As it turns out though, it’s actually quite acidic when infused into cream. My first attempt at this panna cotta resulted in some curdled milk. It was still delicious, but the scientist in me was determined to stop this from happening. Milk curdles when the proteins within it unfold or denature and clump together. For milk, this usually happens under acidic conditions, though excess heat and salt can also cause curdling. In my case, when I added a hot hibiscus infusion to warm milk, the acids that had come out of the hibiscus flowers caused the milk to curdle. The heavy cream that I had infused the hibiscus into didn’t curdle though. That’s because with a higher fat content, there is proportionally less protein content. Less protein means less curdling. But I didn’t want to replace all the milk with cream because then the panna cotta would be too heavy. My solution was to divide the cream: some of it would be used to infuse the hibiscus and some would be added to the milk to lower the overall protein content. I also made sure to cool both the components to barely above room temperature before combining. 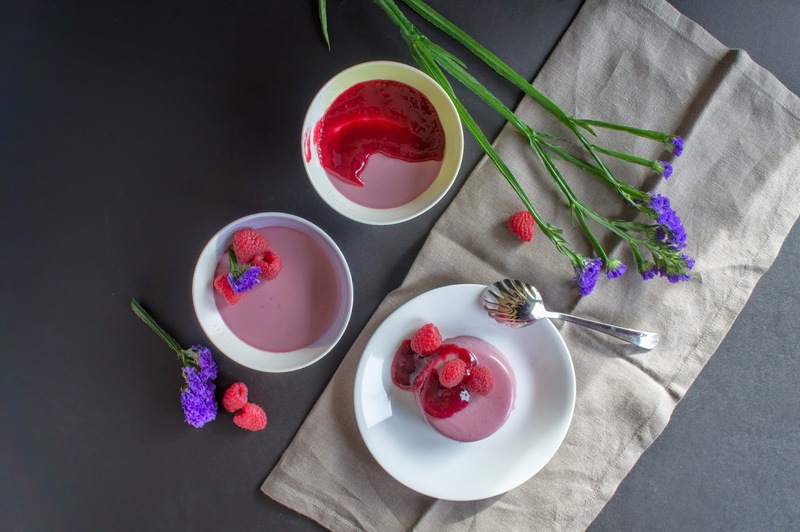 As with most reactions, higher temperatures speed up the reaction: the lower the temperature of the components, the lower the chance of curdling before the panna cotta is set. 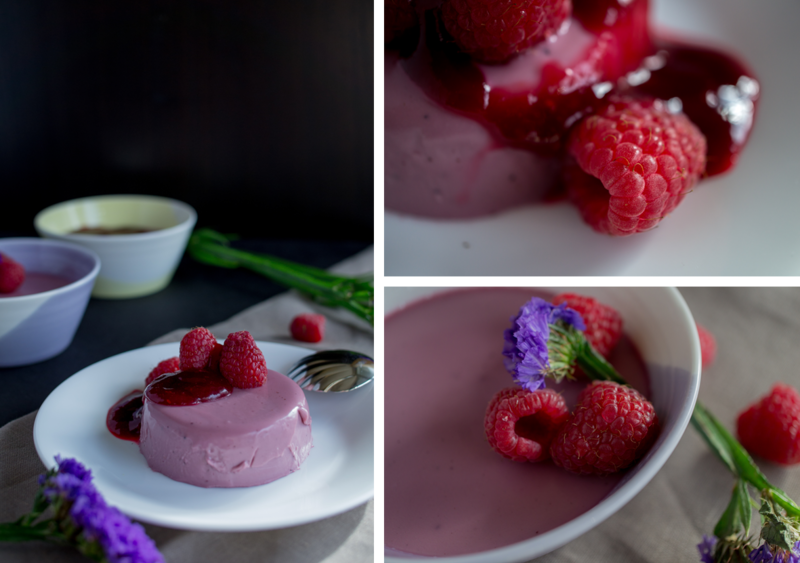 Serving this panna cotta with raspberry sauce just made sense to complement the hibiscus flavours. Plus the purple and red colours together are stunning. 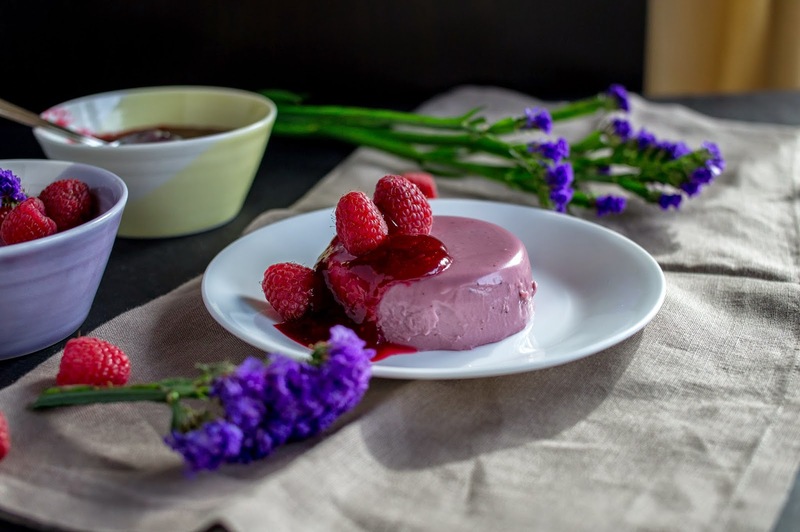 This panna cotta takes very little time to make, is easily modified with other flavours if getting hibiscus is too big a hassle, and seriously looks super fancy once plated. What are you waiting for? Spring is calling! Wipe the inside of three small bowls or ramekins with oil using a paper towel. You want a thin film of the oil remaining. In a small saucepan, heat 1/2 cup of the cream gently until it starts to steam. Do not boil. Add the hibiscus. Cover and let infuse for about 20 minutes. The cream should turn a deep purple-red. Strain the hibiscus out of the warm cream using a fine mesh strainer, squeezing as much of the cream out as you can. Reserve the cream. In another small saucepan combine the remaining 1/4 cup of cream and 1/4 cup of the milk. Sprinkle the gelatin over. Let the gelatin bloom for 5 minutes, then gently heat the mixture, stirring occasionally, until the gelatin dissolves. Add the sugar and continue to heat gently, stirring, until the sugar dissolves too. Remove from heat and add the remaining 1/2 cup of milk. Let cool to barely warmer than room temperature. Once cool, slowly pour the gelatin mixture into the hibiscus infused cream, stirring constantly. Add the vanilla and salt and stir to combine. Strain the mixture into your prepared bowls and let cool completely. Once cool, transfer to the refrigerator. Let set for about 2 hours or overnight. Overnight is better if you want to turn the panna cotta out onto plates. 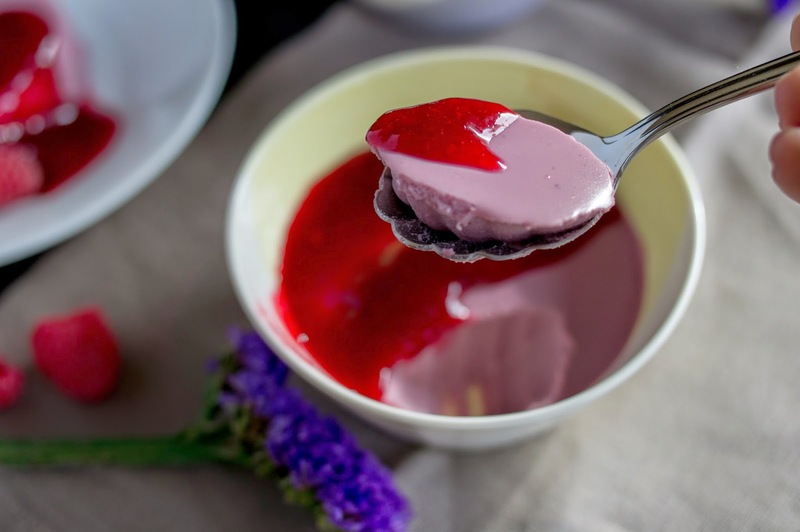 To get the panna cotta out, warm a thin knife or metal spatula under running hot water. Wipe dry and run around the top edge of the panna cotta. Then carefully run the bottom and sides of each bowl under hot water. Place a plate of top of the bowl and flip the bowl over. If all goes well, the panna cotta should come right out onto the plate. Garnish with raspberry sauce and fresh raspberries. Combine all ingredients in a small saucepan. Bring to a simmer over medium heat. Once the berries start to release their juice, smash them up with the back of your spoon or spatula. Continue simmering over low heat until the sauce is thick enough to coat the back of a spoon, about 15 minutes. Strain into a bowl using a fine mesh strainer, pushing all the juice through with your spoon or spatula but making sure the seeds don’t make it through. Cool. 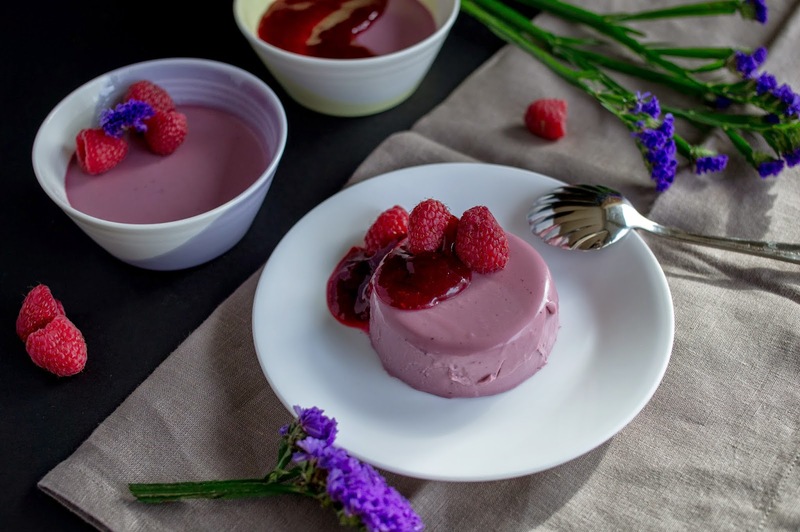 Serve with hibiscus panna cotta (or red velvet cake).